My interests are focused around computers & digital modes. I have most digital modes used by hams. If you would like to test your equipment or do a sked, email me at the email found on the home page or QRZ, my call @ the league. Most often you will find me on during nights or weekends on whichever band has the best propagation for HF: 80 meters, 40 meters, 20 meters. Local: 2 meters & 440. I love to work special event stations and have alot of wallpaper. Best place is to reach me on my nodes or my IDs. If linked below, names link to service real-time status pages and my ID links to node status page. D-STAR: routing doesn’t work to hotspots, email for sked. * Note: node will be online but likely not connected to the RF deck. These systems are integrated with the AllStar node but are setup as completely separate, private, nodes within the AllStar node. You are essentially connecting through the main AllStar node (42441) through RF to the other system (EchoLink, IRLP). Connect the EchoLink bridge to RF: *31195, disconnect: *11195. Connections to EchoLink MUST be incoming into node 233195, no outgoing can be made. Connect the IRLP bridge to RF: *31393, disconnect: *11393. Connections to EchoLink MUST be incoming into node 8393, no outgoing can be made. I have a great QSL that I love to share. The front was designed by Jeff – K1NSS (preview above) who did the artwork for background used for the Ham College postcast. The back was designed and printing done by Amanda – K1DDN of Ham Nation. The card is a mash-up of my interest in digital modes and shack setup. 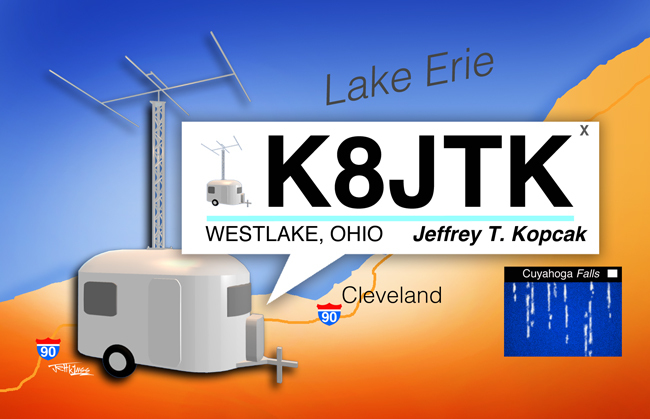 The likeness is an APRS map with the icon and info box relating to my shack – which is setup in an old camper. “Cuyahoga Falls” and the digital waterfall is an Easter egg. Cuyahoga Falls is a city on the east side but the egg is Cuyahoga is the county I live in. Falls jokingly refers to the digital waterfall seen in many digital modes (see Operating Modes above). I love to receive QSL cards! I will reply 100% for all contacts in the log. Shortwave Listener (SWL) cards are welcome but will not be returned. In the U.S.: send your card direct to my call book address. Please include a SASE for a standard sized card. Outside the U.S.: direct to my call book address or via the bureau. Electronic: logbook is uploaded to Logbook of the World. The current month will be uploaded around the 1st of the following month. At this time, I do not use any other electronic QSL service. Thanks and I hope to receive your card!